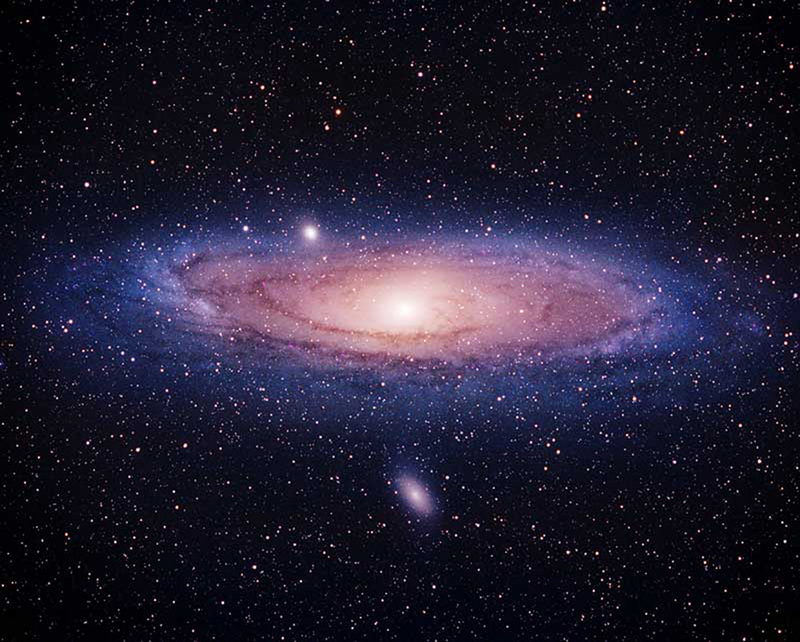 The great spiral galaxy in the constellation Andromeda is approximately two million light years from earth. This makes M31 one of the brightest and closest spiral galaxies. M31 can be spotted with the naked eye on a very dark moon less night. Through a small telescope it appears as a large oval-like gray glow with two faint companion galaxies. This photo was taken under perfect conditions. Deadman mountain is over 10,000 feet in Northern Colorado. At this elevation in late September the temperature drops well below zero degrees. Without a cloud in the sky and very low humidity the conditions were perfect for astrophotography! This composite image of M31 was taken in September 1999. Two 80 minute exposures combined. Location: Deadman Mountain, Northern Colorado, elevation 10,000 feet. Telescope: Astro-Physics 130 mm EDT. Camera: Pentax 6x7 with field flattener. Film: PPF 400 120 format.